Although there are dozens of high quality sewing machines on the market that praise their automatic and ‘fully computerized’ features, it is hard to find one that is truly next-gen.
And by next-gen, we mean having connectivity that you would expect in the age of smartphones and distributed networking, and cloud-computing. Despite still not quite on that level, the Brother SE400 sewing and embroidery machine offers something that is nonetheless unique in the sewing machine market – the ability to import thousands of sewing designs directly from the internet. 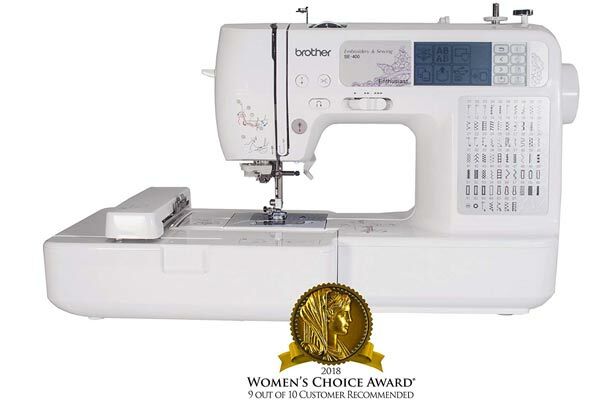 As you will find in our detailed review, this feature of the Brother SE400 opens up a whole new level of what is possible to craft, especially in the embroidery arena in which this sewing machine specializes. 67 built-in stitches, of which you can utilize quilting, decorative, utility, and heirloom stitches. Large LCD screen with back-lighting. Integrates tutorials on how to use all the functions and designs. Automatic needle threading and thread cutting. Direct connectivity to iBroidery.com for importing and updating the sewing patterns. This is via the included USB cable. Bobby winding system, very easy and convenient. In the package you will also get soft cover, 4”x4” embroidery hoop, an operation manual in both English and Spanish, and all the accessory feet you will need: embroidery, zipper, zigzag, blind stitch, buttonhole, monogramming, button fitting, and overcasting. That is 8 feet in total. To top it off, the accessory bag contains your standard fare components: 2 screwdrivers, needle set, seam ripper, 3 spool caps, 3 bobbins, scissors, touch pen, seam ripper, and a cleaning brush. Although you can use Brother SE400 for a full spectrum of sewing work, it prides itself in being the master of embroidery. And nothing is more helpful to becoming an embroidery master than having access to thousands of embroidery designs without having to leave your house in order to buy them in a physical store. In the past, this was all done ponderously slow by hand, which may be a wonderful hobby to engage with. But now, you can drastically increase both the embroidery selection and embroidery sewing. Without sacrificing on the quality of finished crafts. On top of this all, the SE400 is extremely easy to use and one of our top beginner picks you can choose from. If you find that 70 in-build embroidery designs are not enough, by connecting to iBroidery.com, you can acquire and download a huge library of designs directly into the machine. Of course, you can always find other sites as well which offer the designs for free, as a result of collaboration between thousands of sewing enthusiasts. You will encounter every design that you wanted, and some that you haven’t even thought of, from cartoon characters to premium limited-edition patterns. If anything, you will spend more time on browsing and selecting the design than on the actual computerized sewing with the SE400. Most importantly, when you have a computerized sewing machine, you know that it is suitable to both beginners and advanced users, as it has inherent flexibility and versatility. Therefore, it’s all up to you to decide on which level you will operate it. Besides being able to download designs from the internet, another feature of the SE400 that you don’t see too often is the inclusion of a large LCD screen that is not constrained to just showing simple letters and numbers, but one that is capable of demonstrating elaborate patterns. True, it is not on par with the screen capability of modern smartphones and tablets, but it is nonetheless a step up from previous iterations. So, how useful is it? You will find it the center of the whole Brother SE400 machine. Not only will you select the sewing patterns, but it will also help you learn how to operate the machine itself. Notably, the screen is touch sensitive, which is greatly conducive to making it snappy and intuitive. Out of the box, you can choose between 67 stitch patterns, and 70 embroidery patterns. Of course, if you have a particular taste that is hard to satiate with default features, simply use its previously mentioned connectivity. As for the actual work flow, the machine’s right side will hold the diagram of each stich, and the screen is capable of displaying two designs at one time, through which you can easily scroll and select all the designs. Additionally, the memory holds 120 frame patterns. There is a thin line between embroidering and monogramming; however, 5 different fonts and a monogramming foot presser that are included in the package should suffice. Finally, you may have noticed the included touch pen. Brother indeed thought of every aspect of convenience so this addition will be handier than using your finger to constantly tap (and smudge) the screen. It’s hard to talk about the downsides when considering the affordable price tag and rarely seen features, but to help with future improvement it is always prudent to offer some suggestions with our Brother SE400 review. As for the physical aspect of machine’s operation, bobbin case will have to be cleaned more often than usual because of the integrated sensors. On the other hand, it is designed cleverly so it will be easy and quick to clean. Still, it is a task to keep in mind while using the machine on a regular basis. When it comes to the screen resolution, it’s a bit on the low side, something you may find in computer games 30 years ago. If you make the LCD screen one of the primary features due to the computerized nature of the SE400 machine, why not include a higher resolution screen? Even a screen present in entry-level smartphones from 6 years ago would have been far more impressive, and it would certainly not add to the price in a significant manner. As it is, you may have trouble getting used to the meaning of icons representing certain functions. Furthermore, Brother decided to opt for symbols that are not universal but that are arbitrarily designed, so it is necessary to first peruse through the SE400 manual in order to learn them. On a final note, the SE400 machine doesn’t do a good job of reporting why it can’t do something. In short, the error feedback is lacking. For instance, if the selected design exceeds the embroidery area, it simply won’t work without reporting why. Not a big deal, but still something to keep in mind in order to not get stuck and befuddled. Without a doubt, Brother SE400 sewing and embroidery machine reaches the perfect balance between cost and advanced features. Not only will you be able to perform the usual sewing work, but also have a specialist embroidery machine with practically limitless versatility thanks to its ability to download designs from a massive online library at iBroidery.com. The generous inclusion of 8 presser feet and various other accessories makes the purchasing decision even easier. Accordingly, both beginners and expert sewers will benefit greatly from it.